The best socks you’ll never see! These plain-coloured, low cut footlets are BOSS Plain Invisible Stay-On Shoe Liners, made in a comfortable cotton rich blend with added durable polyamide and elastane for secure hold, along with special ‘stay-on’ silicone appliqués at the inner heel to keep them in place. 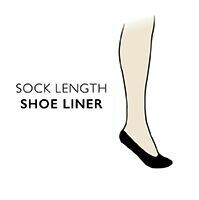 The socks in this twin pack have non-pinching handlinked toes for smooth seams for total comfort and, they are, of course, invisible when wearing most shoes, thanks to their deep cut design.